There are many solicitors to choose from and you need to know that your legal team will do everything possible to deliver your objectives within your timescale. Whether you are involved in a business or dealing with your personal affairs, at Newtons Solicitors we always remember how important your case is to you and put ourselves in your position. 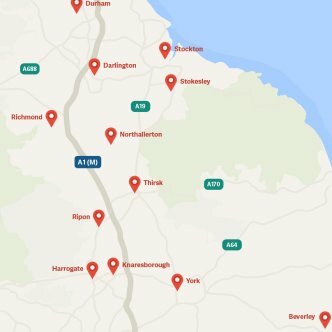 Our team of over 100 professionals are based in offices across Yorkshire and the North East, including; Harrogate, York, Knaresborough, Darlington, Durham, Ripon, Richmond, Stockton, Stokesley, Northallerton and Thirsk. At Newtons Solicitors you will regularly receive clear guidance when you need it together with an experienced lawyer who will look after your best interests. Thank you very much for making the sale / purchase / re-mortgage of my properties a smooth process.Your efficiency in dealing with all queries was outstanding and we wouldn’t hesitate to recommend your services to anyone else. Having recently appointed Newtons we have been delighted with their prompt, efficient and friendly service, all at a most competitive price. We would thoroughly recommend them. I would like to thank Newtons for providing the support I needed to get me through a very troublesome event which occured during my previous employment. Their solicitor was not only a true professional but personable, thorough, efficient, and human with it. Contact us today for an informal chat - we look forward to working with you.